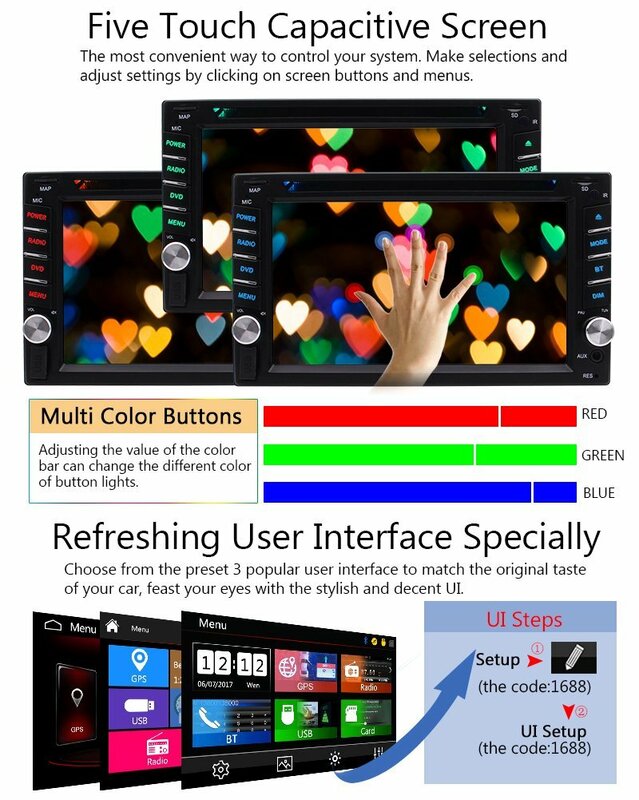 * 1,Latest Windows 8.0 Operation System and friendly User-Interfacce. 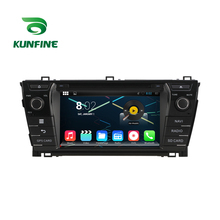 Supports Bluetooth MP3 Player function(This function can only be realized when the mobile pjone supports Bluetooth Audio output). 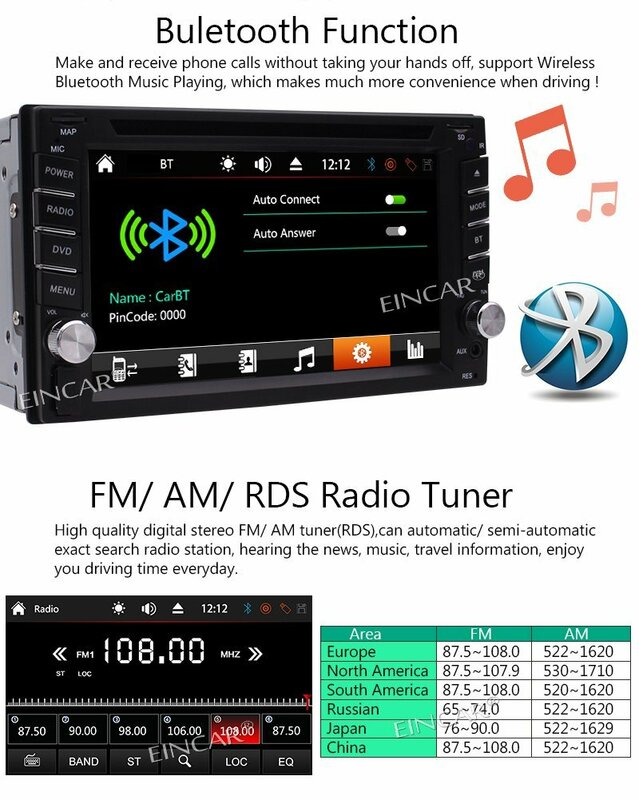 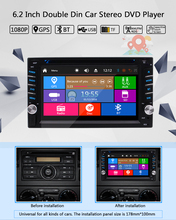 FM AM RDS Raido tuner:high quality digital stereo FM AM tuner RDS, can automatic semi-automatic exact search radio station, hearing the news ,music, trave information,enjoy you driving time everday. 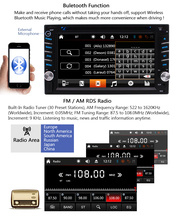 Europe-FM(87.5-108.0) AM(522-1620),North America-FM(87.5-107.9)AM(530-1710),south America-FM(87.5-108.0)AM(530-1620),Russian-FM(65-74.0)AM(522-1620),Japan-FM(76-90.0)AM(522-1629). 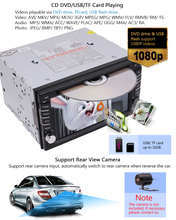 * 2,Free Backup Camera included: Support Front & Backup camera input,front camera need extra fee. 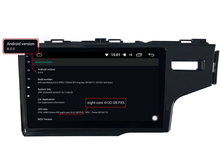 Wide field of view offers a whole lot more of what’s behind you than using your mirror, and you won’t have to turn your head and get alerts for sudden dangers. 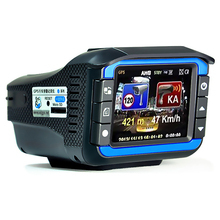 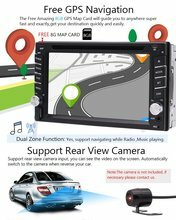 * 3,Free GPS navigation:the free amazing 8GB gps map card will guide you to anywhere super fast and exactly, get your destination quickly and easily. 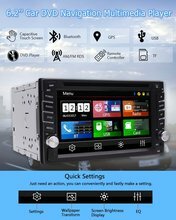 Dual Zone function: yes, support navigating while radio, music playing.it is supports wallpaper transform, screen brightness display, EQ. 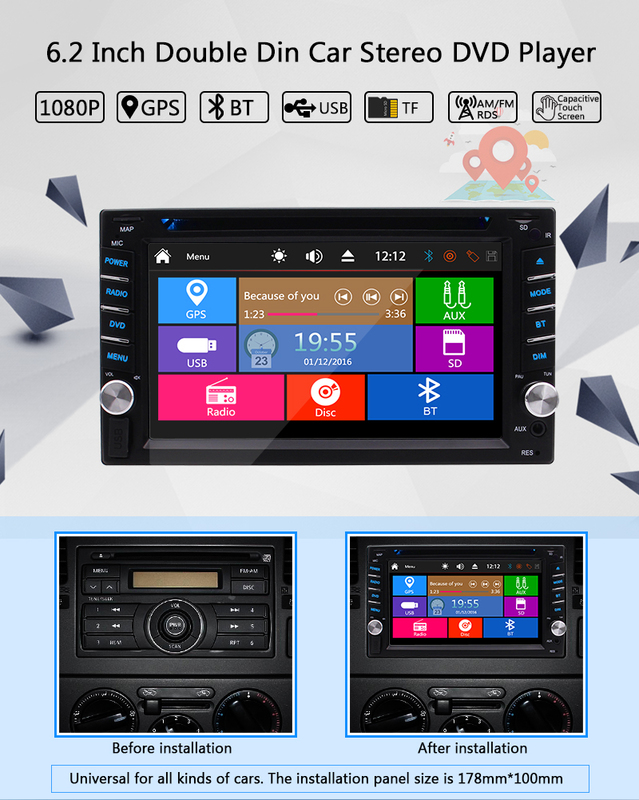 * 5,Bulit in the 3 types of popular User Interface,which you can choose the one you like.it supports 7 colors button backlight.Has Quick selection function, remote conteol fast charging function, Power-off memory function,FM radio function. 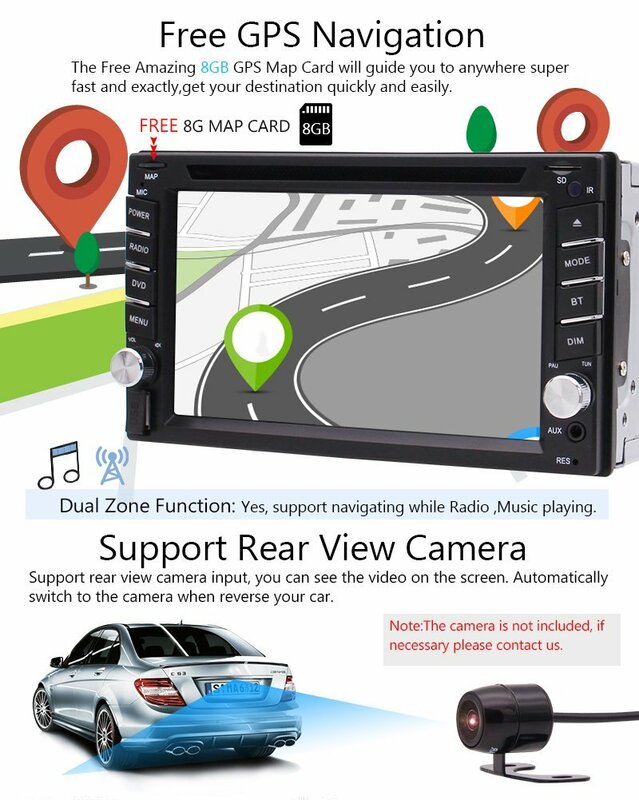 * 2,The wireless view rear camera included. 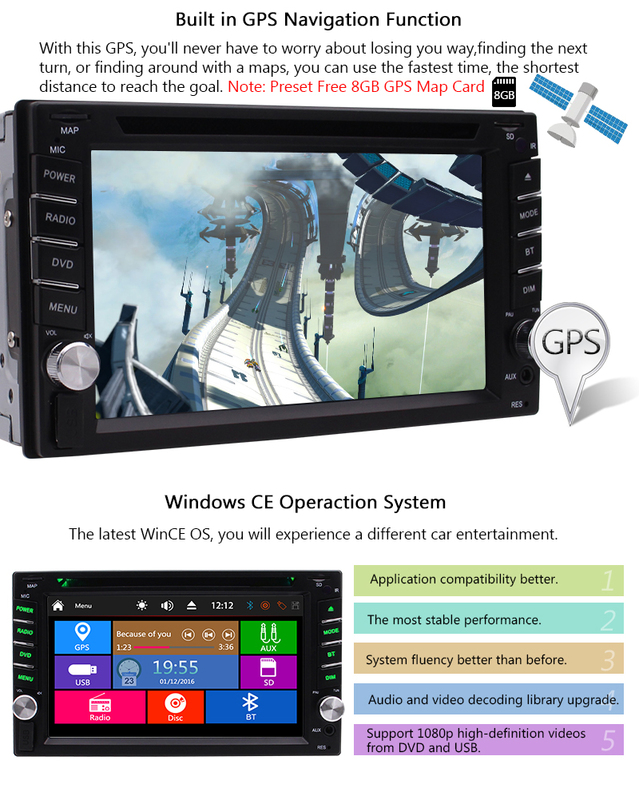 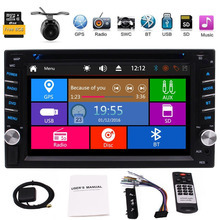 which can help you to avoid hitting the wall, vehicle scratches, the invisible risks.The difference between the rearview camera is: with less connection wires of intermediate video, so wireless installation is much more simple and convenient.Steering wheel control ready: tack control of your music safety and concentrate on the road ahead. 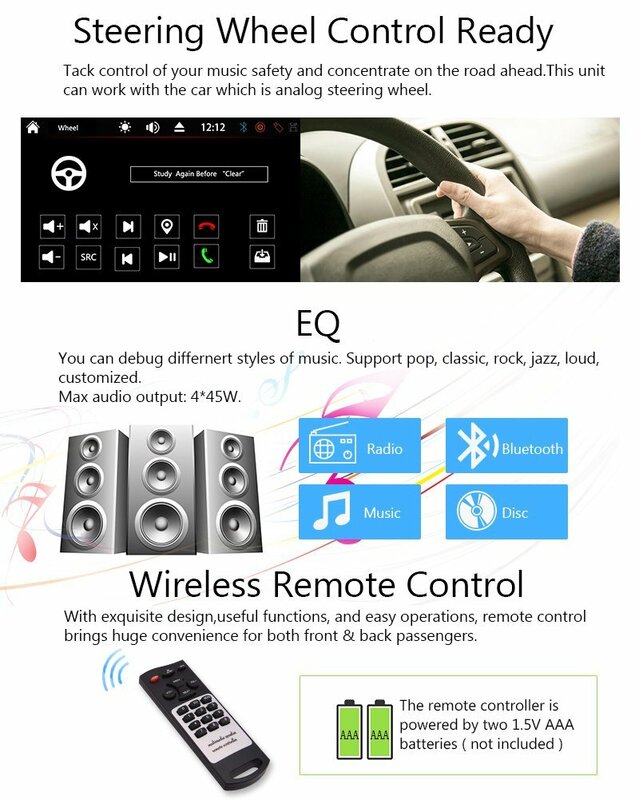 this unit can work with the car which is analog steering wheel. * 4,System language:15 language etc. 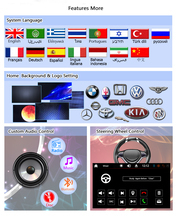 Home background. 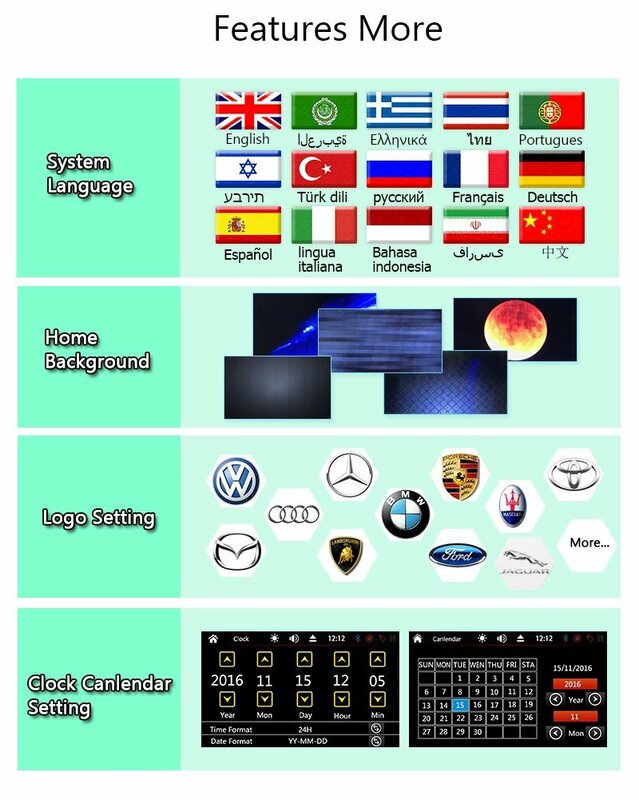 logo setting. 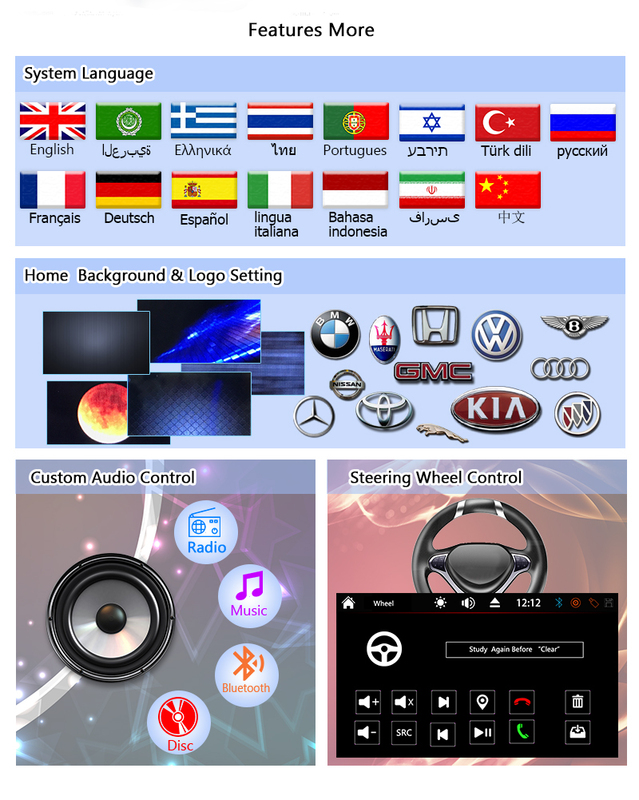 clock canlendar setting. 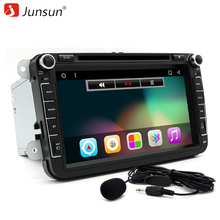 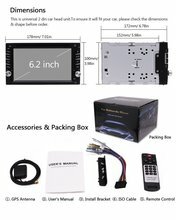 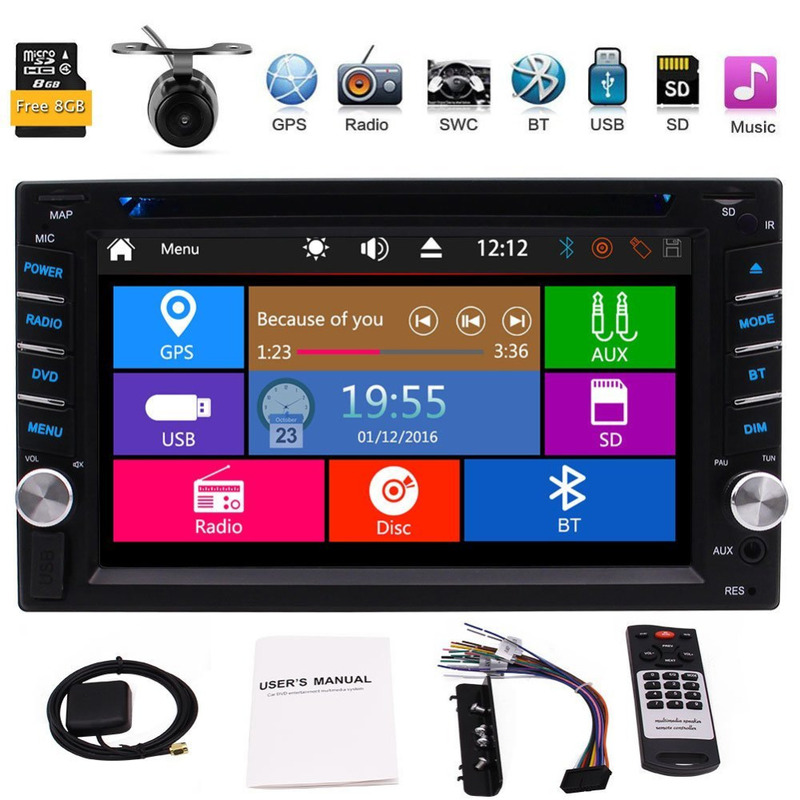 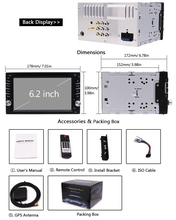 Dimensions: this is universal 2 din car head unit, to ensure it will fit your car,please check the dimensions and shape before order:178mm*100mm. 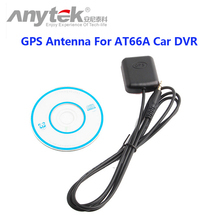 Accessories&packing box:1*wireless camera,1*GPS Antenna,1*user’s manual,2*install bracket,ISO Cable,1*remote control. 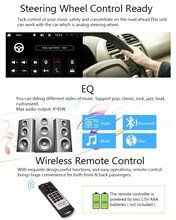 * 5,Preset 3 popular user interface option: the most intelligent, simple,thoughtfully designed interface makes it so easy to operate device. 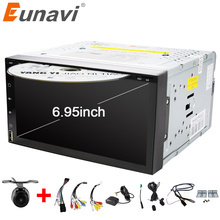 makes everything work together excellently. 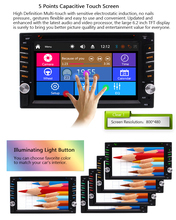 5 points capacitive touch screen:high definition multi-touch with sensitive electrostatic induction.no nails pressure, gestures flexible and easy to use and convenient, updated and enhanced with the lastest audio and video porcessor ,the large 6.2 inch TFT display is surely to bring you better picture quality and entertainment value for everyone. 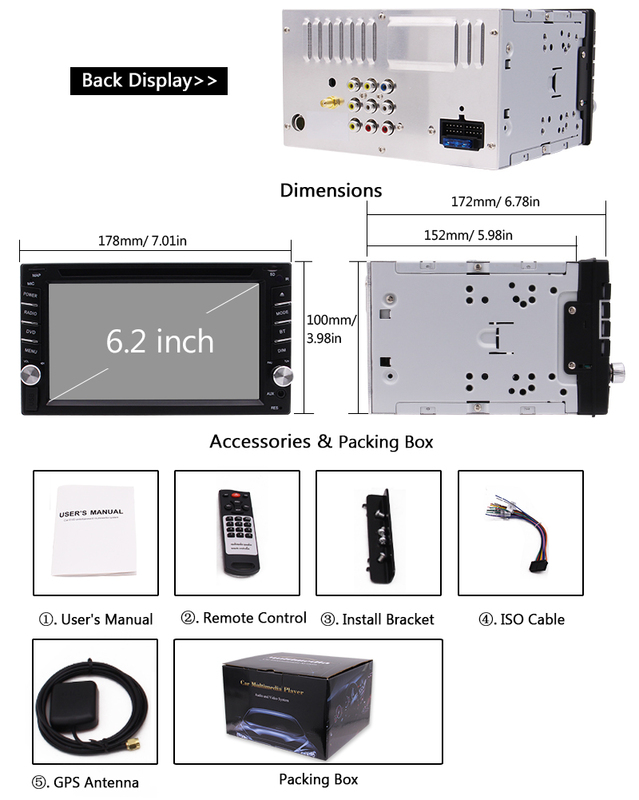 screen resolution:800*480. 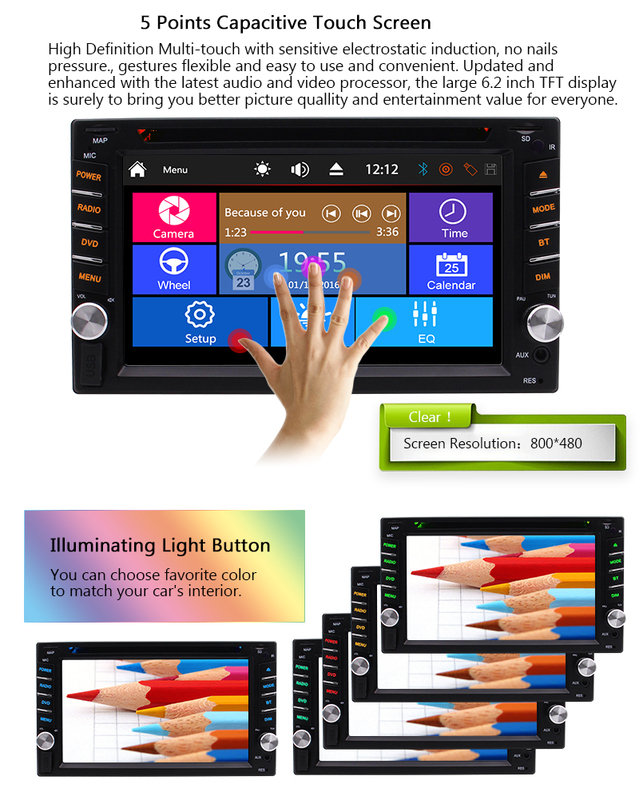 Illuminating light button:you can choose favorite color to match your car’s interior. 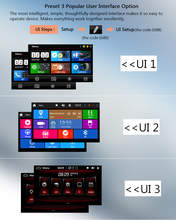 Built-in 3 Types of user interface, personalized UI choose. 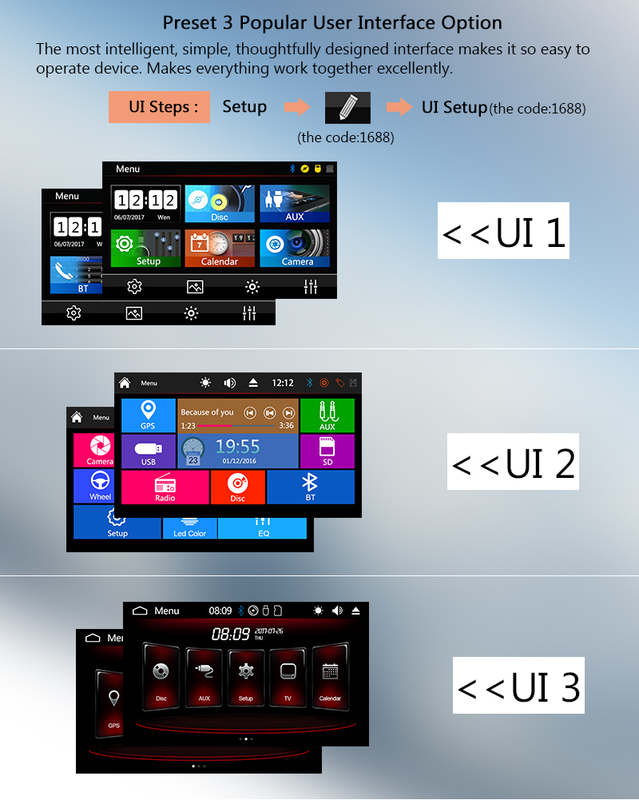 UI is more friendly for driver’s operation. 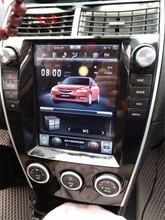 The system operation is more stable and smoother than previous version. 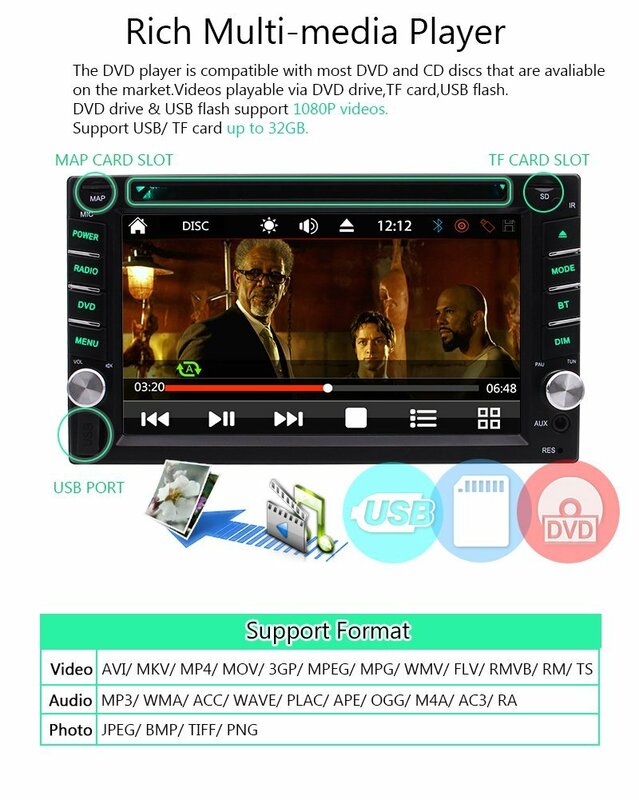 Enjoy Music and Video Everywhere as Build in CD/DVD Player. 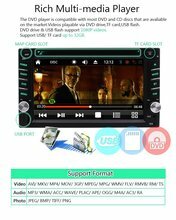 Enjoy lossless music and FHD movie anytime. Support HD 1080P playback. 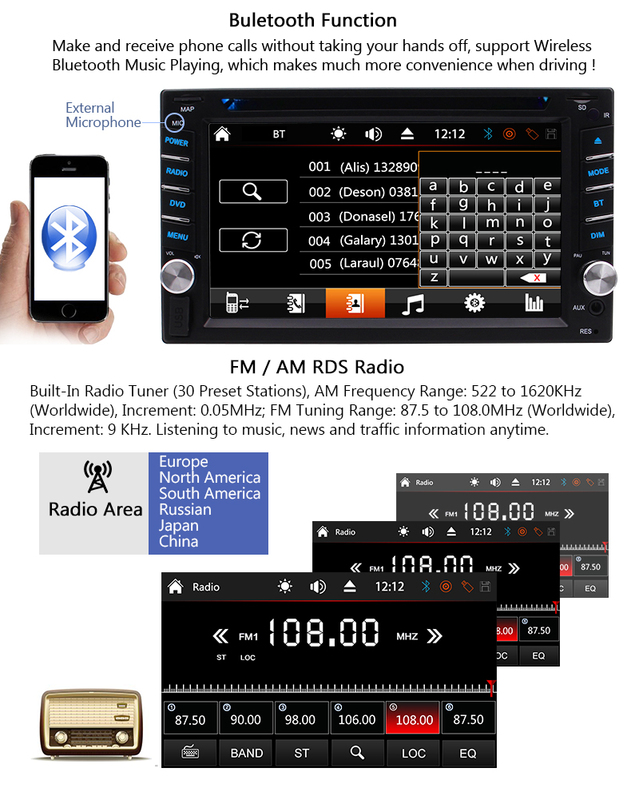 Bluetooth(A2DP) – Share music by bluetooth instantly from smartphone. 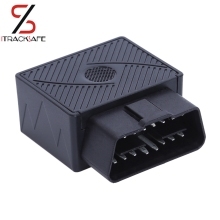 USB port&TF card slot. Save thousands of songs and videos. It’s the most portable way to play multimedia on road.